History of Australian Cinema is a three-part series looking at the early years of the film industry and motion pictures in Australia as “a celebration of a pioneering industry”. This DVD was produced by Jeff Harrison and Gil Mathews for Eskimo Productions, but it is actually a re-issue of three films made by Film Australia. The Pictures That Moved (1969, 45 mins) was produced by Frank Bagnall, directed by Alan Anderson and written by Joan Long. The Passionate Industry (1972, 60 mins) was produced by Frank Bagnall, and written and directed by Joan Long. Now You’re Talking (1980, 47 mins) was produced by Anthony Buckley, written and directed by Keith Gow. DVD technology has allowed us to do more than just re-issue older films with magnificent sound and image quality: it is possible to add all kinds of information, as well as to set up the programs in such a way that viewers can control what they see. This DVD package provides only a minimum of this kind of facility. It simply presents the three films, with the capacity to locate certain topics within each – topics that might be of use within a classroom. It makes no effort to correct errors in the original films, to bring the story up to date, or to add comment from contemporary scholars or practitioners. Some viewers may be disappointed with this, but I am not sure that this is a weakness: it leaves the three films to stand alone and make their own impact. So, let us re-visit them singly, before discussing them together. I have seen this film many times on a grainy 16mm print. What is lost in the translation to the small screen is compensated for in the sharpness and clarity of the DVD images. The stock from which the film excerpts have been chosen is more than 100 years old, so the occasional blurred or shaky image (from deteriorating nitrate film) can be forgiven. On the other hand, some of the footage is astonishingly clear: if you knew the people in 1896 in the street or at the races you could identify them as they pass the camera. Of course, as time passed the camera work became more sophisticated, no longer a mere record. And some camera operators are just better than others: for instance, Frank Hurley’s scenes of Mawson’s ship stuck in the Antarctic pack ice are luminous. In addition to the film footage, there are some facsimile reproductions and an occasional filmed demonstration of old apparatus (a Cinematograph camera/projector and a limelight burner). The sound track, of course, is from the 1960s. When the films from which the excerpts were taken were originally shown, they would have had a live musical accompaniment – at least a piano, perhaps a small group (piano, violin and drums was a favourite combination), or in the big city first release houses a full orchestra. In this compilation, appropriate music has been added, often based on folk songs or popular songs of the time. This works well in cases like “The Curse of a Broken Heart” over the party scene from The Sentimental Bloke. There is, however, some discomfort for anyone who recognises “The Old Bullock Dray” being played over the image of a horse team dragging a wagon laden with wool bales. There is the usual voice-of-god commentary, interspersed with actors reading selections from contemporary sources, and on one occasion (The Story of the Kelly Gang ) an attempt to reproduce the kind of dialogue and sound effects that would have accompanied the original presentation. There are also occasional interviews: Reg Perry reminisces about being the front half of a lion in his father’s production of Soldiers of the Cross (1900), Herc. 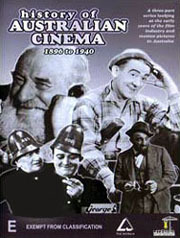 McIntyre remembers his brothers’ tent shows before World War One, and Raymond Longford urges contemporary filmmakers to seek out “good Australian stories… full of sentiment”, describing himself as “the Sentimental Bloke”. These men have long since passed away, adding a dimension to their recorded words that was not there in 1969. The argument of the film is one that needed to be made in the 1960s – that Australia once had a thriving film industry, capable of expressing an Australian national identity. So the period 1896–1920 is called an “age of innocence”, which presented a “genuinely Australian ethos”. The commentary speaks of the Australian audience’s “hunger to see their own environment”, and how indigenous films satisfied this hunger by depicting Australian history and national events such as Australia’s contribution to World War One. Our folk heroes were presented often in a bush setting, as Australians were considered to have a “nostalgia for the pastoral life”. The government recognised the value of film in advertising Australia to the world, but, by the end of the period covered in this first part of the story, Hollywood was taking over across the world, and Australia was in the process of becoming one of Hollywood’s most enthusiastic markets. So the film ends with extensive coverage of Australia’s greatest silent film classic – Raymond Longford’s The Sentimental Bloke (1919). It lauds the “warmly human qualities” of the film, and points out that it was not appreciated in USA, where its language was not understood and its production values did not match those of Hollywood. Some statements made in this compilation are now known to be wrong and some interpretations would now be challenged. Since the film was made, several fragments of The Story of the Kelly Gang (1906) have been recovered, so it is incorrect to say that no scenes survive. 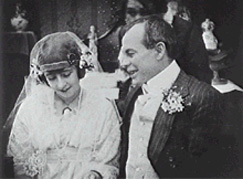 The acquisition of these and other small segments from early films, means that The Romance of Margaret Catchpole (1911) is no longer the earliest fiction film from which fragments survive. The responsibility of the National Library to collect and preserve Australia’s film heritage was passed over to the National Film and Sound Archive (renamed Screensound, but recently reverting to the earlier NFSA). We now know that James Pinkerton Campbell preceded Bert Ive as official commonwealth cinematographer, and the theory that film was used as a “chaser” to encourage the audience to leave at the end of a vaudeville performance has been largely discredited. Given the scope of the film’s coverage, however, it holds up well and has dated surprisingly little. The argument for an Australian national identity expressed through film is stated clearly and consistently, though never stridently, throughout the film. This argument, however, is currently unfashionable in some academic circles. In part 2, image quality is better, as is only to be expected when the originals are not quite so old, and therefore usually in better condition for copying. The sound track is a similar mix of voice-of-god commentary, actors reading from contemporary documents, and music selected to complement all this. Coverage is similar to part 1. The history of cinema buildings now includes the wonderful ceiling of the Melbourne Capitol, the atmospheric cinemas such as the Sydney Capitol, and “the greatest picture palace of them all” – the Sydney State Theatre, opened in 1929. But there are also screenings in country halls and in open-air theatres such as the racially segregated audience at Broome’s Sun Pictures. The musical side of film presentation is discussed – the great Wurlitzer organs, the orchestra conductors, the supporting stage productions. In this part of the trilogy, however, the argument in favour of a national cinema becomes rather more strident. Though the films offer “a portrait of a vanished, naive Australia”, it is suggested that their function of representing Australia to Australians is no longer so generally recognised or appreciated. In this decade, Hollywood has captured the international market, and Australia has become one of America’s best film customers. In answer to the question “Why were so many directors forced to give up?”, the film’s commentary blames the block-booking contract system, introduced to protect the product of the chief distribution firms, which were largely branches of or agents for the Hollywood majors: so, “The Golden Years of Hollywood were often the grim years for filmmakers in other parts of the world.” The commentary notes that the traffic between Hollywood and Australia is two-way: Arthur Shirley or Charles Chauvel or Louise Lovely find Hollywood a useful training ground, but return to Australia to put what they have learned into practice. However, this does not produce a level playing field: the dominance of Hollywood is represented by the production of the blockbuster, For the Term of His Natural Life, when Australasian Films required Raymond Longford to stand aside as director in favour of American Norman Dawn. So this episode winds up with the verdict of the Royal Commission that they can find no evidence of a Combine, the refusal of the Premiers’ Conference to cede powers over film to the Commonwealth and the final blow – Australian films “made obsolete overnight” by the introduction of sound. However, all is not lost. Though Australian film is described as “a small-scale, home-spun, uncertain sort of industry”, it is still capable of making gems such as The Kid Stakes (1927), which has the last word – a long excerpt from the cricket match sequence, and further images over the final credits. Along the way, we have seen the familiar parade of feature filmmakers. It is the end of the line for Raymond Longford and the McDonaghs, both of whom make their last features in the early ’30s. However, Frank Hurley continues, A.R. Harwood enters the fray, and Frank Thring makes a huge impact until his untimely death in 1936. Ken Hall keeps continuous production going at Cinesound, and Charles Chauvel demonstrates his “love of things epic and Australian” by making films that “throbbed with national pride.” George Wallace prat-falls on his left ear, Errol Flynn sets hearts racing, Peter Finch makes a strong impression in his screen debut, and Roy (“Mo”) Rene makes his one and only film – but it is the arrival of stars from overseas (such as Helen Twelvetrees) that draw the biggest crowds. Ironically, the commentary is presented by expatriate Leo McKern – a voice more familiar to later Australian audiences through the British television series Rumpole of the Bailey. Meanwhile, back in the 1930s, documentaries and newsreels are making a good showing – the Duke of Gloucester visits Down Under, Don Bradman demonstrates his batting style, depression bread-lines remind us of the underside of Australian society, aviator Amy Johnston receives a hero’s welcome, the Sydney Harbour Bridge is opened by de Groot and enjoyed by thousands of sight-seers, and finally Australian troops march off to training camps and then to war. From this period a larger proportion of Australian films survive, providing a potentially larger pool of material, and the introduction of sound makes the extracts less alien to modern audiences. The stilted acting and the excessive national sentiment can sometimes make us cringe, but there are also delicate moments, like the opening sequence of Orphan of the Wilderness or delicious scenes such as Mo deciding he has found a cause worthy of actually getting a job! The industrial history is interwoven with all this. It starts bravely with local inventors and innovators taking to sound enthusiastically, but soon falters, with the failure of the quota legislation and the consequent failure of new production ventures such as Pagewood. Part of the blame rests with governments, which do not enforce the quotas, but foreign control of the Australian market through block-booking is still presented as the main reason for the decline. The compilation style continues across this third part of the story – a combination of film excerpts, music, voice-of-god commentary, and occasional still images. The “coo-ee” provides a recurring theme, a familiar sound heard repeatedly in film excerpts: it provides a peg on which to hang memory when Australians are far from home, establishing a sense of both place and community. All three films are excellent examples of the classic compilation film form – a form often used at that time by Film Australia. They were part of the “national program”, that is, films funded out of Film Australia’s central budget, rather than commissioned by client departments. They were produced in-house, by Film Australia staff, who considered nationalist sentiment not out of place, though by that time some irony or reflexivity was encouraged in its expression. 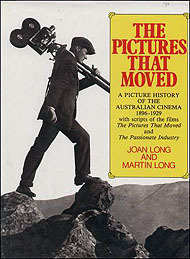 In 1982, Joan and Martin Long published a heavily-illustrated book: The Pictures That Moved: A Picture History of the Australian Cinema 1896–1929 with scripts of the films The Pictures That Moved and The Passionate Industry (Hutchinson, Australia), which still makes a valuable companion piece to the films (and now the DVD). In Joan Long’s own story of “The making of the films” (pp. 11–16), she recognised that “All films date in style and content”, and that “No presentation of history can ever be called definitive” (p. 14): she would not, then, have been surprised or distressed at a later reviewer picking up on what would now be considered “errors”. She describes the research process, in a time when there were no reference books and precious few articles about Australian film. Alan Anderson had begun the research for The Pictures That Moved before her arrival on the team, and both of them delved into old newspapers and journals, put appeals for information into the newspapers, interviewed people with long memories. As they put part 1 together, Long and Anderson were instructed not to use any excerpt that had already been employed by Tony Buckley in Forgotten Cinema (1966) – the only film previously made on the subject. This was not too difficult, however, as Buckley’s film was a general survey, that had made little reference to the very early period covered in The Pictures that Moved. 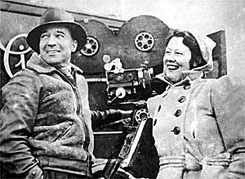 On the second film, Long had more time for research and better facilities, so she was happier with the result. She was also not particularly enamoured of Anderson’s interviews with Longford and Perry in part 1: she felt that an interview “took a lot of screen time in relation to the information it imparted and the visual interest it held” (p. 14) so she changed the strategy in The Passionate Industry to quote selections from people’s words over their portraits. The most interesting revelations in Long’s introduction are those concerning the political implications of the films. One thread, which might be considered mildly “political”, was the team’s concern at imminent threats to the great old picture palaces in Sydney, which were slated for “redevelopment”: their response was to take photographs, to make sure that at least some images were preserved. It was, however, their stance on the power of Hollywood which held up the release of the second film and nearly stopped it altogether. The Passionate Industry had been in production since early 1970, but by the time it was viewed at double head in 1972 by the Producer-in-chief and the Head of Production of Film Australia, the federal government’s Tariff Board enquiry into the motion picture industry was in full swing, and uncomfortable parallels with the 1927 Royal Commission led to the film being described as “politically dangerous” (p. 14). Eventually, it was judged to be objective enough for release, even at a time when local production was “an explosive issue” (p. 14). Joan Long, even while she speaks of aiming for “objectivity”, understood that the writing of history is never innocent, whether in print or on film. She must have been aware that the production of a trilogy of films about the early years of the film industry in Australia would play a role in 1970s debates concerning similar struggles of indigenous film against imported productions. To the credit of all concerned, the three films do this with considerable humour, and surprising restraint – never making explicit the obvious parallels between the years which are the subject of the films, and the years during which the films are being produced. For the 1970s was a key decade – a period when the whole Australian cultural landscape, including the film industry, was being re-shaped by government intervention on a scale never before imagined. It started in the late 1960s, with a UNESCO Symposium on professional training for film writers, producers and directors, and a report from the Film and Television Committee of the Australian Council for the Arts. Out of these came the Experimental Film and Television Fund, the National Film and Television School and the Australian Film Development Corporation. All of these were operational by November 1971, when a Tariff Board enquiry into the film industry was announced. Public hearings were held in Sydney, Melbourne and Canberra from September to November 1972, with submissions made by all sections of the industry and many interested individuals and community groups. The report created a furore, reported – in very similar terms to reports of the 1927 Royal Commission – as a “Battle to break foreign hold on the film industry” (National Times, September 24, 1973). In April 1972 the South Australian Film Corporation, the first of the state film production/encouragement agencies, had been established. In 1975 the Australian Film Development Corporation was replaced by the Australian Film Commission. By the end of the decade both state and federal governments were well-launched on the program of financial support for the film industry that underpinned the revival of Australian feature-film making. Film Australia’s trilogy – no matter how “objective” the filmmakers claimed to be – was clearly a part of the debates around these developments. Back before the 1970s, the argument against government intervention in favour of local production was two-fold – any Australian film that was good enough would make it on its own merits, and those that were not did not deserve government support anyway. The debate still seems to play variations on these themes. Every year, in the film awards season, the quality of local film production is deplored, and the bulk of the output is again judged to be mediocre – as if that justifies abandoning it to the vagaries of the free market. There are two problems with this argument. First, it assumes that the rest of the world operates a free market policy, when that is not so – not even in the USA, the largest supplier of film and television in the world, which should make it invulnerable. Secondly, it proposes that government support only the very best – as if this can be predicted at funding stage, and as if everyone knows what the criteria for judging what is “good” might be. But no industry (again, including USA) produces only outstandingly good films or television programs. To be viable, a national production industry needs a broad range, across forms (documentaries and advertising and telemovies and reality programmes – as well as drama), across genres (lifestyle programs and sport as well as telemovies, quirky comedies as well as literary adaptations), across styles (art-house and commercial movies, Australian Idol as well as Australian Stories) – and across “quality”, whatever that might mean. An Australian industry needs the capacity to survive its failures, and that can only happen when there is a healthy and broad foundation, that can absorb the occasional turkey – or, more significantly, the general run of the mediocre. Thirty years before I entered art school, Australia had a thriving film industry. But its leading lights – legends such as Charles Chauvel – ended up in poverty because American distribution companies moved in and replaced Australian films with cheap imported product. Which brings us back to the Film Australia trilogy, which functions so well as a reminder of those “lessons of history”. These three films made an important contribution to the pressure in the 1970s for government support for the revival of an Australian feature film industry, and they can be read now as having a triple significance. They present the films of 1896–1940 to later audiences who might well have forgotten their existence. They represent to Australian audiences the case for indigenous film production that was influential in the 1970s when the compilation was made, and that has led to the production of so many local films and television programs – however local audiences may judge them. Finally, they remind audiences in the noughties that Australia has a long and proud film heritage for which we have fought successfully in the past – and which deserves to be recognised and protected in the present. Perhaps I am reading too much into something quite simple. But I wonder how this DVD will be read in 2034, after we have learned from experience what a Free Trade agreement can do to our local industry. Welcome to Issue 34 of our journal! Ina Bertrand is a freelance writer and also a Principal Fellow in the Cinema Studies program at the University of Melbourne.